Whether or not leaders are born, they can (also) be made. And that’s where our business schools enter into the equation that is business. It’s no secret that business is changing at a breakneck pace. As such, teaching and learning must keep up with these changes, especially at the collegiate level. The good news is that we live in a nation and state where opportunities abound. Bright ideas lead to good jobs and a growing economy. What’s important, though, is what we do with those opportunities. This is an element that business schools have begun to take to heart, promoting an awareness of ends while teaching the basics of the means. For instance, at Grand Canyon University’s Colangelo College of Business, we prepare students not only to excel in the jobs of today and tomorrow but also to become global citizens. Ours is a values-based curriculum designed to arm the next generation of workers with skills they need to perform on the job but also to impact their communities and society in positive and lasting ways. It’s all part of a concept called conscious capitalism. The glue holding together all the multitude of specific skills necessary to running a business is leadership. Business schools have syllabuses of their courses; In Business Magazine wanted to explore how leading local business schools are addressing the leadership factor, and asked them to share their philosophy and processes. I add my voice to this cover story with more focused discourse on an aspect of leadership development that is personally meaningful. Disruption puts an even greater strain on leadership. And disruption is all around us today. 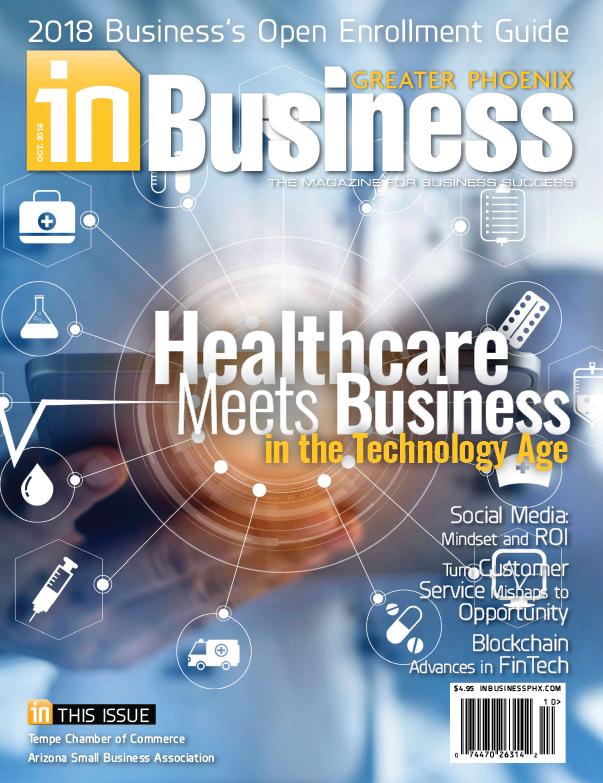 Brian Marcel, in the feature article “The Future of Blockchain Technology,” discusses blockchain as one of these disruptive forces, and the kinds of impact it could have on a variety of industries. Another feature examines the importance of our personal reputation. As Mike Mooney discusses on the Roundtable page, leaders, in particular, are often in the spotlight, making it both harder and more critically imperative they carefully manage their reputations. 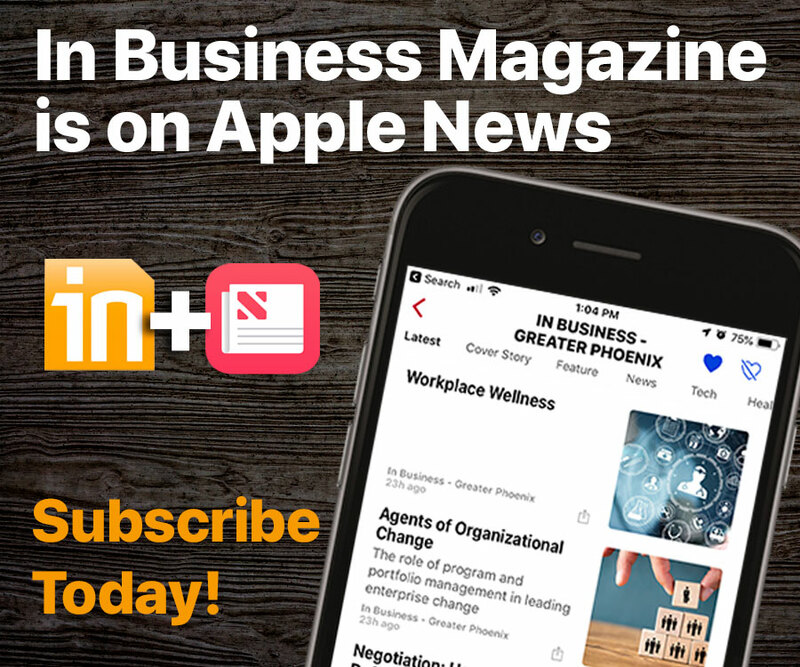 Timely articles on other pages include “How to ICE-Proof Your Business in 2019,” prompted by the immigration crackdowns at places of business, and “USMCA: Agreed and Signed but Now What?” in which a local attorney discusses the trade agreement that replaces NAFTA and its potential impact on business in Arizona. How autonomous vehicles will affect the real estate market is the topic explored on the CRE page. And we are introduced to entrepreneurs — on the Startups page and From the Top — who are building their businesses in niches where they identified overlooked opportunity. Those stories and more comprise the business-relevant content aimed at helping strengthen our business community. 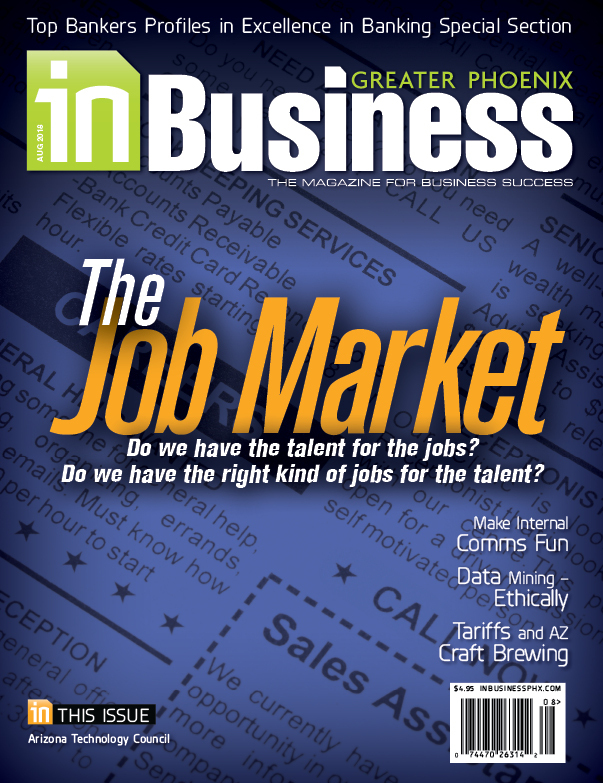 I am pleased to have helped bring you this February issue of In Business Magazine and hope you enjoy it. Jerry Colangelo is the managing director of Men’s Basketball for USA Olympic Basketball, chairman of the Naismith Memorial Basketball Hall of Fame, and a principal in JDM Partners, a major projects real estate and development company that has built arenas to office complexes. His humanitarian and philanthropic endeavors have resulted in well over $100 million going to charities that help children, the elderly, women, homeless and education. Colangelo is the quintessential American and global success story, having gone from a childhood living in attached boxcars to the national and world stages — architecting and leading the winning of Olympic Gold Basketball three times and winning the coveted MLB World Series, setting an historic first. And, while Colangelo was building immensely successful professional sports and business organizations — including branding and starting the Chicago Bulls and creating a Phoenix Suns franchise that sold in 2004 for a then-record price — he reinvented America’s fifth largest city, Phoenix. He turned vision into leading an effort that has delivered a vibrant, world-class downtown, and ignited and led the renaissance of Central Phoenix with the building of Talking Stick Arena, Chase Field and Comerica Theater. He has brought the same amazing transformation with his partners at the historic Wigwam Resort in Litchfield Park. His name sits proudly on the Jerry Colangelo College of Business at Grand Canyon University.